There are two types of vitamins: fat soluble (A, D, E and K) and water soluble (B-Complex and C). Fat soluble vitamins are hydrophobic, which means they clump together when mixed with a water-based solution. You can see this in action by pouring oil in a glass of water. The body’s transport system is water-based. In order to absorb fat soluble vitamins, the body uses a process called emulsification. Emulsification is the process of breaking down fat soluble vitamins into a form that can mix with body’s water-based transport system. The Biocellular Micellization process performs the process of emulsification, transforming fat soluble nutrients into a water soluble form, but goes a step further by pulverizing the particles into a form that is easy for the body to absorb. 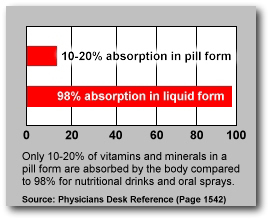 In 2008, Physician's Desk Reference published a study stating a body absorbs approximately 98 percent of the vitamins and minerals in liquid form compared to 3 to 20 percent of vitamins in pill form. Additionally, liquid vitamins bypass the emulsification process and therefore go directly into the bloodline within minutes. Biometics is currently the only company that can produce products using the patented Biocellular Micellization process. All Biometics products are designed and manufactured at an FDA and OTC approved facility. Does your multi-vitamin dissolve properly? 2. Drop your multi-vitamin (or other pill) into the vinegar, and jostle it about every five minutes or so by gently shaking or swirling the cup. While you can also stir the mix with a wooden stick or toothpick, be careful not to touch the tablet itself. 3. The tablet should dissolve within 30 minutes. (This is the USP standard for all pharmaceutical tablets.) If it doesn't dissolve within a full hour, it's not doing you much good. Get another brand!